Were you looking for Employment Law - Colorado or Workers Compensation lawsuits? Workers compensation is a type of insurance coverage that employers must provide for their employees. Except for some specific exclusions, all employers are required to provide workers compensation insurance coverage for their employees. Some workers may have been unreasonably denied their Colorado Workers Compensation Benefits or had to wait a long time for benefits to begin. In some cases, workers compensation lawsuits can be filed to ensure the employee's rights are protected. Send your CO Workers' Comp claim to a lawyer who will review your claim at NO COST or obligation. In Colorado, the Division of Workers Compensation does not pay benefits on a claim. Instead, employers obtain workers compensation insurance from a private company and the insurance company pays the benefits. Most employees, both full and part-time, are covered under workers compensation from their first day on the job. For employees injured on the job or who develop occupational diseases, workers compensation insurance pays for medical expenses and partial wage replacement during periods of temporary disability and may also provide permanent impairment benefits. The cost of workers compensation insurance is paid entirely by the employer, who is not allowed to deduct the premiums from an employee’s wages. When filing a workers compensation claim, it is important to have an experienced Colorado workers compensation attorney to advise you, protect you from unfair practices and advocate for a fair settlement. All on-the-job injuries, no matter how small, should be reported to your employer in writing within four working days of the injury. If you don't report an injury in writing within four days, you may be penalized but you can still file a claim for benefits even if you are late. 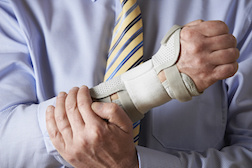 Your employer should file a report of your injury with its insurance company, which starts the claim process. If the insurance company determines that you are eligible for benefits, it will start paying for authorized medical benefits and provide compensation for lost time from work. However, your claim may also be denied. The insurance company may deny your claim for any number of reasons, including if the adjuster has reason to believe that your injury is not work-related. If your claim is denied, you will be responsible for all medical bills associated with the illness or injury. If your claim is denied, you can participate in mediation and/or hearings and settlement conferences to try to obtain compensation. However, an experienced workers compensation attorney can guide you through the claim process from the beginning, helping to make a case for your Colorado workers compensation benefits, especially if you are permanently disabled from work-related injuries. In 2012, a federal judge approved an $8 million settlement in a class action filed by Walmart employees. Walmart and its adjuster Claims Management Inc., had to pay $4 million and Concentra Health Services in Colorado, through its insurer was to pay a separate amount of $4 million, according to The Denver Post. "Plaintiffs, representing Walmart workers injured on the job, sued in March 2009," according to The Denver Post. "They alleged the retailer, CMI and Concentra hindered medical providers from making independent judgments on how to treat injured workers." In another Colorado Case, a truck driver's workers comp attorney obtained a $300,000 settlement in a workers compensation case instead of only the partial benefits that the insurance company wanted to pay. If you or a loved one has suffered a loss as a result of Denied Workers Compensation, please click the link below and your complaint will be sent to a lawyer who may evaluate your Colorado Workers Compensation claim at no cost or obligation.